Visitors at this month’s Intertextile Shanghai Apparel Fabrics are encouraged to check out country and region pavilions from Hong Kong, Japan, South Korea and Thailand, in addition to pavilions from India and Pakistan, and two Taiwan Pavilions to learn about the latest trends. “While New York, Milan, Paris and London have traditionally been seen as the most prominent fashion capitals in the world, apparel brands and consumers are increasingly turning to Asian trends. Although Tokyo has long been known for stand-out street style, it’s only recently that the Seoul effect – a rise of South Korean popular culture, such as K-pop – has led to even more globally influential trends from the Asia-Pacific region,” the show organisers explain. From 27-29 September, an exciting array of leading exhibitors will join the country and region pavilions. With the Asia-Pacific region’s apparel industry booming, economic growth can extend throughout the supply chain, creating unlimited opportunities for textile innovation. Highlighted exhibitors will show the latest fabrics and fabric technologies on the market, designed with global trends and catwalks in mind. The popular Japan Pavilion will return this year, predicted to once again be packed with buyers seeking the latest Japanese styles and trends. The Japan Fashion Week Organisation will display high-quality fabrics from 31 Japanese companies, while the accompanying Japan Pavilion Trend Forum introduces four new trends: Egoist’s Essence, Lost in Utopia, Rustic Logics and Fashionista – Instagram. In touch with Japan’s unique sense of style and technologies embedded in a long history of fashion development, the Autumn/Winter 2019-20 trends each explore blended palettes and balance soft hues with vivid colours, presenting a must-see insight into the world of Japanese fashion. Highlighted Japanese exhibitors include Amaterrace’s high-performance functional fabrics and Crystal Cloth’s woven cotton, silk and print textiles. Daiichi Orimono will bring its super-high-density woven fabrics. 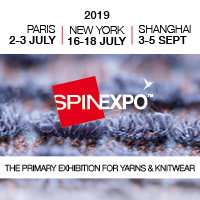 Another must-see exhibitor is Sanyu Trading, featuring its wide range of in-stock, high-quality denim, knit fabrics, synthetic fibre fabrics and yarns. Not forgetting another emerging centre of fashion is the nearby Korea Pavilion, organised by the Korea Fashion Textile Association (KFTA), which will bring a variety of leading South Korean exhibitors. Alphafabric will showcase innovative fabrics and accessories with unique finishing for fashion trends, such as fancy jacquard, digital prints and colourful tweed. Great Duksan will showcase an array of woven and knit fabrics, while Hyochang’s one-stop knitting and dyeing service and Yesung Textile International’s 100% premium cotton and cotton-mixed fabrics are predicted to attract plenty of visitors. The Korea Pavilion will also feature a trend area, with its Autumn/Winter 2019-20 theme set as Redefine – a focus on sustainability in fashion and creative individualism in minority groups. What’s more, the Taiwan Pavilion exhibitors will be conveniently situated in hall 4.1’s Functional Lab. E. Textint will showcase its rainbow-coloured reflective heat transfers, suitable for outdoor and performance fabrics, and Honmyue Enterprise will bring sustainable 100% recycled polyester, which is water and oil repellent. Tiong Liong Industrial will display its triacetate conjugate fibre, which has been developed to expand and retract under different heat and moisture conditions for ideal breathability and ventilation. In hall 5.1, the Taiwan Pavilion has arranged its own trend forum, which like the Korea Pavilion will place emphasis on sustainability. Think Taiwan for Textiles is Taiwan Textile Federation’s slogan, as the forum is set to gather around 300 textile samples for visitors sourcing products with excellent sustainability, innovation and functionalities. More fashion fabrics can be sourced at the Hong Kong Pavilion, organised by the Hong Kong Trade Development Council, with highlights including Chun Wing Hing Textile’s synthetics and synthetic blend fabrics, Tak Shing Hong’s fashion lace and garment accessories, and Tak Hing Textile’s high-quality imported woven fabrics from Europe and Japan, plus its own fabrics from the company’s China and ASEAN region production lines.